Wanna try this artful craft? 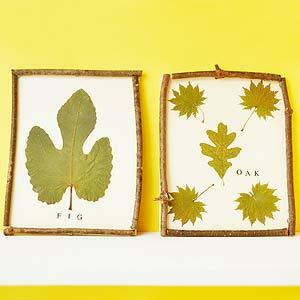 Inspired by the pages of old encyclopedias, framed leaves are a quick, artful craft. On a piece of neutral cardstock, print the name of a leaf in a nostalgic font. Adhere a pressed leaf to the cardstock. With crafts glue, adhere nearly straight twigs to the edge of the cardstock to make a frame. this is a cute frame! kayang-kaya yan sis.. project naten yan sa sining noon.. haha..
May ginagamit na device to pressed flowers as well without losing its color! Nalimutan ko lang what is the name, anyhow, naging project nga ito s Schoo dati! very nice kaayo sis pero wala lang lagi pud ko talent ana... toinkz! nice.. love to try this..